KJA 871F is a Leyland Titan PD3/14 with East Lancs H38/32R body, new to Stockport Corporation as their no. 71 in February 1968. It is preserved at The Manchester Museum of Transport in Boyle Street, Cheetham Hill. Greater Manchester. The museum is next to an operational bus garage. It is photographed on 24/7/10 returning to the museum on a shuttle service from Heaton Park, during a running day linking the museum and the tram system at Heaton Park. It is preserved in SELNEC livery. Stockport’s second attempt at something "new fangled"!! After years of almost dedicated conservatism Stockport dipped their toe into the second half of the twentieth century with this, the first of their first batch of 30 foot long double deckers. Apart from the length, nothing else changed. Rear open platform, East Lancs bodies with wind down windows and draught/drip strips. Still a magnificent vehicle and one of the few body styles to really look good in SELNEC orange. As a matter of interest, Stockport’s first attempt at modernity was the inclusion of translucent roof centres from 1964 onwards. …..but they did try tin fronts on the 1958 Crossley bodies – and finally went mad and had a batch of forward entrance PD3s….. The livery is an abomination compared with that which it bore before the advent of SELNEC and the blinds are totally unsuited to the apertures but as an example of the way that presentational standards dropped during the ’70’s it is perfect. Actually, Stockport’s first attempt at modernity was the trolleybuses of 1913 but perhaps that experience persuaded the Transport Dept to draw in it’s horns thereafter though they did order several TD4c’s as tramway replacements …. adventurous by their standards! Truth is that conservatism paid for Stockport. They got a standardized fleet of reliable vehicles and ran a profitable organization even though most of their vehicles were two man operated and they had the advantage of lower dwell times that omo fleets. Mind you, I should have hated to have to drive a PD3 for a living! The SELNEC orange and white has had a lot of bad press amongst enthusiasts. I think this was largely because it replaced a lot of cherished and varied municipal liveries in the area. In itself I thought it was not unattractive and in some instances was an improvement on the previous municipal scheme. I quote as an example Rochdale’s dreadfully bland all over cream with a bit of blue which was adopted for spray painting in the early 1960’s. The majestic Weymann bodied Regent V’s looked much better to me in SELNEC livery. It was really designed for rear engined buses and did generally sit uneasily on front engined double deckers particularly where an exposed radiator was used. One thing in SELNEC’s favour was that it went for something new and did not favour any of the previous liveries of any of the constituent operators. West Midlands got a watered down Birmingham livery for example with no recognition of the other three operators involved. The same applied on Tyneside with South Shields not getting a look in. Orla has a good point about the trolleybuses, especially as they were Lloyd Kohler system of current transfer – a total dead end in the trolleybus world. I’m not sure the tin fronts were an attempt at modernity. Leyland decided to standardise on the tin front and later St Helen’s fronts. For a period, there was a small premium for the traditional radiator. This coincided with Stockport’s tin front and St Helens front orders – so the adoption of these styles was typical of their monetary conservatism. Philip restates a long held misunderstanding regarding the design of SELNEC’s livery. It was definitely not designed for rear engined vehicles, or even the SELNEC "Standards", the design of which had not been finalised at the time the livery was agreed. In 1970 I had a meeting with Tony Harrison in his office in Peter House. On the window ledge was a range of bus models, some Corgi, some Dinky, some hand built and a mix of single deckers and front and rear engined double deckers in an array of colour schemes. Whilst I was there for another reason to be revealed in an article in due course, I asked Tony what they were for. As I found out later when he was my boss, he wasn’t the most patient man but he told me they had been used when the livery was designed and he gave me chapter and verse on how the SELNEC Board were frustrated by what at the time was a negative public and media reaction to the scheme. He told me that they had decided to avoid any reference to any of the constituent Transport Departments’ colours and had looked to have designed a layout between the orange and warm white which would look balanced on any vehicle even when side advertising was applied. 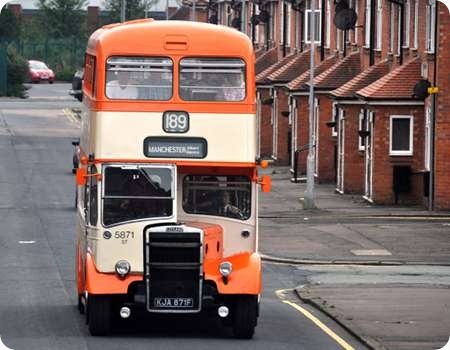 Stuart Brown in "Greater Manchester Buses" states correctly that the orange band above the lower deck windows was not to be more than 12 inches deep and the white on the between decks panel was to be fixed at 26 inches. This is where the misapprehension regarding the scheme being designed for rear engined vehicles arises. Whilst the "Standard" design hadn’t been finalised when the dimensions of the scheme were worked out, the dimensions were exactly those of the Northern Counties "Standard" but not of the Park Royal version, which had a deeper between decks band. At the time they had expected to keep rear entrance double deckers until the end of the 1970s, given the slow delivery rate from the Leyland group so needed a scheme to cover all types. The initial scheme the designers came up with was the Mancunian scheme with the white replaced by orange and the red by white. There was a model of a rear entrance bus in Tony’s office in that scheme and it look terrible, particularly around the rear nearside, though it looked a little better on a rear engined model. It was quickly rejected. Once real vehicles were painted two things became apparent. With certain types, keeping to the dimensions made some bodies look ungainly. The difference in depth of the orange below the upper deck window line due to window depth, to maintain the 26 inches between decks white dimension, gave the impression of random application when different bodies were seen together. Secondly, after a short period of time, different paint shops decided to vary the application to suit certain body styles. The Northern Division was the worst offender. Bury’s MCW bodied Atlanteans were painted almost correctly but almost identical Bolton versions had different paint dimensions and Bolton’s East Lancs bodied Atlanteans had different versions almost batch by batch. Bolton’s MCW front entrance PD3s had a unique version of the Orion scheme with virtually no orange under the windows making the between decks white very wide. What had been intended as a non-partisan, unifying scheme rapidly descended into something resembling a visual disaster. Although Stockport had a conservative vehicle-buying policy and never operated a rear-engined double-decker, a batch of Bristol VRs was being built for them at the time of SELNEC’s formation but a fire at the factory destroyed them all before delivery. This must have been the East Lancs factory in Blackburn. Someone will know more! There is a story that at least one of the chassis ended up in New Zealand. The fire was at the East Lancs Blackburn factory. The full story will appear on this Forum shortly. One VRT chassis was certainly saved in complete form and ended up in Woollagong Australia with a locally built body. It’s been stated that of the rest, those that could be salvaged were broken for spares. There is a story that Daw Bank would not have received the vehicles and that they would have been sent to Leigh where they would have been used to introduce OMO service, their lower height would have allowed them to be stabled in the old Corporation depot. Philip H mentions South Shields not getting a look in with the new T&W PTE livery, Sunderland were in the same boat. T&W decided that their livery would be based on the yellow of Newcastle Corporation, they went through several different permutations before they eventually settled for something not a million miles from where they started. The change would have been obvious to anyone living in South Shields or Sunderland, whereas most people in the Newcastle area would hardly be aware that the livery had changed. In a recent edition of ‘Classic Bus’ there was a brave attempt by Mike Eyre based on Soton buses to interpret what the VR’s would have looked like had they made it to Stockport including mock ‘J’ registrations in the JA series. Unfortunately I think the answer is ‘ugly’ especially with the treatment of the radiator grills and had they gone to Leigh I should not have wept. Orla, I haven’t seen the Mike Eyre attempt but I can say two things with certainty based on seeing the first of the batch complete and painted. The vehicles would have looked very much like any other East Lancs rear engine design, similar to the last Bury Atlanteans and Fleetlines plus radiator grilles a la the delivery of VRs to Sheffield in 1972. As Mike’s attempt was based on Southampton, I assume you mean the livery layout. Of course the bus was painted in full SELNEC colours but no logo or legal lettering had been applied when I saw it so the veracity of the Leigh story cannot be confirmed. The front indicator layout was standard SELNEC with a number indicator in the usual SELNEC nearside position. My East Lancs’ contact promised to look out the correspondence with Stockport regarding livery for my subsequent visit. My contact said he seemed to remember they had been asked to quote for both the traditional Stockport layout and a revised layout based on that supplied on the Leopards. There seems to have been a division of opinion in the Stockport Transport Committee regarding the Leopard scheme. He did comment that the traditional layout cost a few pounds more per bus due to the extra masking and lining out. Of course my subsequent visit never materialised as the fire intervened, destroyed their records and lost me an order for SELNEC! The first attempts at modernising the look of the early rear engined double deckers fell broadly into two camps: the peak and angle treatment (Liverpool and Bolton) and the curves (e.g. most Alexanders, plus other builders using Alexander features). Unfortunately by 1970 the standard offering from East Lancs had a foot in each camp, with a peaked dome above a curved windscreen, which always jarred with me. This is the version which Mike Eyre used as the basis for his image. The curved windscreen was not obligatory, however – the Sheffield VRs didn’t have it, and neither did the Fleetlines ordered by Bury and delivered to SELNEC. As for the grill on the Sheffield VRs, the attempt to hide it rather than make a feature of it was not a clever idea, although I’m sure it must have saved a few quid! Move the staircase forward to the standard front entrance position and add the grille and you have the bus as I saw it. The Sheffield East Lancs bodied VRs were withdrawn by the PTE as non-standard in the late seventies They went on to have long lives with various NBC companies notably Crosville and Hastings & District In late 1974 one was on loan as a demonstrator to West Yorkshire PTE I saw it working the Bradford-Halifax service New VRs did not figure on WYPTE orders but its successor Yorkshire Rider ran many after they absorbed West Yorkshire Road Car in 1990. I note with some surprise that Stockport Corporation does not feature in the list of operators on the website, so perhaps this picture of two of Stockport’s excellently proportioned all Leyland PD2s might redress this omission. I believe that I took this photograph, which dates from 1969, somewhere in the Manchester area. I have no doubt that our Forum experts will identify the location. No 293, EDB 547, and its fellow parked behind it (No.294, I think) was a Leyland PD2/1 with Leyland H30/26R bodywork delivered in 1951, and was representative of a batch of 44 of such buses taken into stock from 1949 onwards. They were preceded by some 40 Crossley DD42s, all with Crossley bodies, and the Corporation’s experience of these machines was such that the Leylands were chosen for the 1949-51 deliveries. However, Crossley, whose post war factory was in Errwood Park, used the "local employment" argument to secure the subsequent order for 24 DD42/7 buses with Crossley H30/26R bodies, much against the wishes of the Transport Department. Thereafter, however, Leylands reigned supreme in the Stockport fleet. No 293 passed to the new SELNEC PTE in 1969, no doubt ultimately to suffer the appalling indignity of being repainted into the truly ghastly orange and white garb of that organisation. In any list of the worst bus liveries of all time, the SELNEC effort must surely rank near the top, even against strong challenges from the present day privatised crop of aesthetic abominations. Could we have a league table of hideous liveries? South Yorkshire’s bilious yellow & red was pretty bad- Yorkshire Rider wasn’t wonderful as isn’t Fussy First either, but the award surely goes to Lincs Roadcar/Yorkshire Traction (did both have it?) low floor purple and yellow. For sheer design boredom, we have to go back to NBC who also managed to pick some pretty horrid shades, which takes some doing in red and green. This photograph is taken in early SELNEC days (they have SELNEC legal lettering). These were the first of a variety of Stockport buses to work from the former SHMD depot in Stalybridge. They were most of the remaining Leyland-bodied PD2s from Stockport – 293, 297-9 and 303-306 (EDB 547/51-3/7-60). The renumbering took place, from memory in early 1971 so I suspect your shot is from 1970. It is in Stalybridge bus station. For comparison there is a photo of my own on this site in almost exactly the same location at this link. Whilst I understand your sentiments about the orange livery as it didn’t generally sit very well on older buses, I think it served its political (i.e. neutral) objectives and orange became very successfully synonymous with Manchester area buses for many years. Quite a number of this batch were sold to Berresfords of Cheddleton and were a familiar sight at Longton Bus Station still in Stockport livery having worked on the service from Leek. All Leyland PD2s rank among my all time favourites. I never really came across these, despite being a student in Manchester from 1971 – 1975 (and then ’til 1976 in Warrington). Living in South Manchester I was very aware of the Stockport East Lancs PD2s (and the Crossley PD2s as well). What immediately struck one was how superbly turned out and maintained they were in stark contrast to the Manchester fleet. The "all red" Manchester livery with painted window surrounds must have been an all time low – pictures of the earlier Red/Cream looked so much better. Manchester buses in the early 1960’s (pre-Bennett era) always gave me the impression they were painted by some sort of dipping process. Everything apart from the tyres and glass was red! The fleet at this time really had a careworn appearance. On the subject of Crossleys, the company seemed to get a lot of business on the basis of the ‘local jobs’ card in the early post-war era. Not only Stockport but Manchester and Oldham took large deliveries and one detects local politicians overriding the wishes of the professionals when these decisions were made. I read recently the phrase "distress purchasing" referring to what people buy that they can afford, or what is available, as opposed to what they really wanted (eg Korean or Communist block cars of time gone by). Just about all post war Crossleys were distress purchases. People bought whatever was available in a bid to buy sufficient vehicles to replace those worn out by war time privation. Very few chose to buy Crossley. It is well documented that Stuart Pilcher (Manchester) always wanted to buy AECs but the Manchester Councillors always blocked it, insisting on Crossleys because they were local. Sheffield’s post war Crossleys were all transferred from orders made by other authorities – their preferred AECs, not to mention Weymann bodies, not available in sufficient numbers. I really must spring to the defence of the original SELNEC livery. At the time I didn’t like it either, since it obliterated all those splendid municipal liveries, and there’s no doubt it looked pretty awful when applied to some older types, and when it was badly weathered. However, if you look at the SELNEC Standards, for which it was designed, the proportions of the paint perfectly complement the body style. Looking back forty years on, it was light years ahead of the ghastly insipid schemes adopted by all the other PTEs and NBC, and was a real trend-setter. And (whisper it softly) a few of the older buses actually looked quite well in it: Stockport’s East-Lancs PDs being a notable case. General opinion seems to be that there was nothing wrong with the postwar Crossley except its engine. The same could also be said of that other postwar "distress purchase" the Daimler CVD6, necessitated mainly by a shortage of Gardner engines. Birmingham numbered both types among its tin-front standards, but by the time those Crossleys were delivered, AEC had purchased Crossley and sorted out its engine problems. I once met someone from Birmingham who had worked on both types, and he said that the Crossleys were far superior to the Daimlers! The engine is rather important, though. Sheffield had some distress purchased CV6s as well. Again, the engine was rather critical. [Earlier posts on this web-site tell of the Daimler engines’ weaknesses better than I.] Having said that, all that Peter says is true. Certainly the basic Crossley chassis was well engineered, but in addition to the engine, which AEC improved, but could never make into a really sound unit, Crossley steering was always exceedingly heavy, and the three axle Dominion trolleybuses were nigh on impossible in this respect. The characteristic that emerges from Crossley, apparently due in no small part to the personality of Managing Director Arthur Hubble, is the refusal to listen to or learn from customers. I agree with the defence of the Selnec livery. I actually quite liked the original orange and white and some buses looked good in it, the Mancunians and Selnec Standards particularly so. I also thought some of Manchesters late batches of PD2s in the 36xx and 37xx series suited it too, in an odd way. I didn’t like the later GMT livery which incorporated brown however. I used these buses regularly in the 1960s on the 92 route mainly but also on the 74 and 40. The Leylands were superb so the drivers of the underdog Crossleys often needed to prove that actually they were better. However sometimes from the back of the depot a couple of Guy Arabs emerged. These had protruding radiators and wartime blackout blinds in their rear upstairs windows. It was almost a privilege to get a ride on one of these. They all seemed like they would last for ever but they are probably all gone now. That said, there was nothing better than to stand at the roadside and hear (were they the last batch bought by Stockport??) the newer Crossleys on the ‘flagship’ 33 route from Manchester to Romiley – a limited stop route where much higher than normal speeds were evident between stops which were sometimes almost a mile apart…. A bit off track, and apologies, but I wonder if anyone has any pictures or remembers the rather unique ten Leylands purchased by Stockport which had Longwell Green bodies ? I think that they were perhaps the last vehicles ever purchased by Stockport, and eventually replaced the Crossleys on the 33 route before passing over to SELNEC. Vivid memories of using them, although I’ve never been able to track down a picture of them – even here we don’t list Longwell Green amongst the body builders and maybe Stockport’s were the only examples in municipal service. Stuart there are shots of the Longwell Green PD2s on www.sct61.org.uk dating from 1960 these unusual buses always looked very ECW in appearance to my mind. From 1962 Stockport bought exposed radiator East Lancs bodied PD2s and finally PD3s with front entrance bodywork. They actually ordered Bristol VRs but these were written off in the East Lancs fire. Stuart, I’d forgotten about the Longwell Greens until you mentioned them. [I was a student and then worked in the South Manchester area from 1971 – 1980.] The last Leylands for Stockport were PD3/East Lancs in 1968/9. Longwell Green, I believe came from the Bristol area but were very popular for a time with Newport (South Wales) Corporation. Ref the comment about Municipal operation of Longwell Green bodies. There were certainly LG bodies on Leylands at Newport and from memory a number of the smaller Welsh municipalities also used this bodybuilder. I have a couple of photographs of these Longwell Green bodies online and visible here and here Both show these buses working from Oldham in 1973, but still in Stockport livery. I don’t believe any ran in service in orange but many of the batch did get the orange livery as they became training buses, in which role they ended up being seen all over Manchester. The EDB Crossleys would have been more lively than the earlier examples as they had the later and more effective downdraught engine – probably why they were used on that service. Longwell Green were based in Bristol and did quite a bit of rebuilding as well as new bodies. They seemed to find a market in South Wales with Newport in particular buying a lot of (exposed-radiator) PD2s with their bodies. The last I’m aware of were two 1966 AEC Regent Vs with front-entrance bodies for Pontypridd Urban District Council in 1966. Thanks everyone….And particularly to Chris for his link to PJA 913….I’ve spent a couple of years trying to find a photo of this batch, and I’d have to say that having seen this one last night they were as elegant as my memory would have it….Different enough to be different enough, if you know what I mean….Does anyone have any idea why, out of the blue, Stockport chose Longwell Green ?? Also on the same page is a wonderful picture of EDB 578, one of the final Crossleys that I was talking about – and wouldn’t you know, operating the 33 route from Manchester to Romiley and ( on this picture ) Greave….I can’t remember if the 33 route was a joint operation with Manchester, perhaps it was, but there also used to be the older Manchester Crossleys which always operated the Manchester only 109 route from Reddish via Gorton to Manchester City Centre….Memories of taking both routes on the same day and even as a youngster being aware of the difference in acceleration and speed between the older Manchester vehicles and the then cream-of-the-fleet Stockport vehicles…. Sorry to wander away from Stockport Corporation a little but there’s something odd about the vehicle in Richard’s link. The date of the Longwell Green body is given as 1955 and I took it to be a PD2 at first glance but the registration, EBX, was issued in March 1948. The radiator suggests that it could be a re-bodied PD1. The date of the body would be correct, it’s certainly not a 1948 body. There was an article on here a while ago which I think had a link to a James fleet history but I’m unable to find it now. Does anyone have the details about this vehicle? Stockport ordered Longwell Green bodies due to price and the demise of its traditional bodybuilders- Crossley and Leyland. Apart from the English Electric bodied pre-war Tigers, and the wartime Guy Arabs (in that instance Stockport didn’t have a choice) the fleet was traditionally Leyland and Crossley bodied. From conversations with people in the works and depot in the 1960s the bodies were excellent but no repeat order was made as Stockport’s manager, Eric Baxter,was due to retire in 1962 and wanted to start a fleet renewal policy with a standard vehicle, before he went. He thus ordered PD2s again but, needing continuity of supply and the possibility of large (for Stockport) orders by the middle of the decade, he needed a larger builder than Longwell Green which mixed bus building with its main occupation of van building. Frank Brimelow replaced Eric Baxter and by 1963 had worked with East Lancs to refine a very traditional body to Stockport’s needs, a lineage that lasted until SELNEC took over. Ironically East Lancs couldn’t cope with Stockport’s needs by the middle of the decade and had to sub let one order to its Neepsend subsidiary. There are comments that the Longwell Green bodies have an ECW look. This may be so but the story I was told was that the frames were from Burlingham who ceased double deck production in 1960. Stockport had wanted Burlingham to tender as Baxter greatly admired the Manchester Burlingham bodies delivered from the mid 50s. 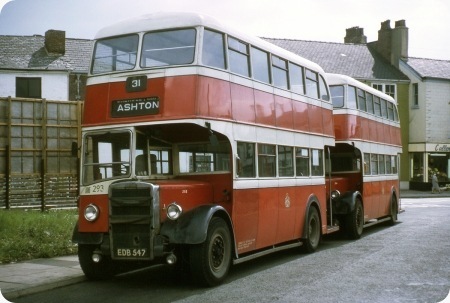 As Stockport had not needed new vehicles between the all Leyland and all Crossley buses of the early 1950s, his only chance to order Burlingham bodies came with the 1957 order for PD2s which higher authority insisted was given to Crossley – a bad decision as Crossley closed down before the order was completed and some of the bodies were finished by the Corporation. Chris B: Well spotted – EBX 663 was a rebodied PS1. According to the PSV Circle fleet history of South Wales Transport, who took over James in 1962, it was new in 1948 to James; in 1954, it was converted to PD1 spec including new chassis frames, by Western Welsh at their Ely Works, then rebodied by Longwell Green. No details of the original bodywork,unfortunately. But any idea what happened to this batch after SELNEC ?? Straight to a date with a blowtorch, or did they live on somewhere, hopefully in a less ‘garish’ livery…. To the best of my knowledge all the Longwell Green PD2s went to the breakers after further service with SELNEC. They fell victim to both SELNEC’s reduced life policy and the drive to change all services to OMO around 1973, though 348 (PJA 918) stayed on as TV1 (Training Vehicle 1) in the driver training fleet. I don’t have a date for withdrawal. As SELNEC maintained a wide range of MCTD policies, almost all vehicles withdrawn went for scrap (a policy which left large gaps in the range of MCTD vehicles available for preservation) and this also reduced the availability of vehicles from other fleets absorbed. There are numerous references in a variety of publications and forum posts to the Stockport Longwell Green PD2 having a look of ECW about them and, in fairness, the output from ECW on Leyland PD1s do seem to have some resemblance. http.www.sct61.org.uk/nw217. The Stockport bodies were almost the ultimate development of the Longwell Green genre which had been around for half a decade or more. Before leaving on my trip I tried to research any link between Longwell Green, Bristol and ECW. The only link I can find is that Bristol built bus bodies until around 1955 which, after WW2, resembled ECW products, ECW at that time of course was THE builder on Bristol chassis for the Tilling Group. At the same time Bristol was building cabs for its trucks. When it closed the Brislington bodyshop it transferred the cab jigs to Longwell Green. Other than that there seems to be no link. The Longwell Green/Burlingham link is equally difficult to prove. Apart from what I was told at Stockport the body style looks like a toned down version of the Burlingham product, the spectacle type of rear upper deck emergency exit windows being the major visual link. As Longwell Green used the style well in advance of Burlingham finishing double decker production, I assume there must be some record somewhere of an agreement. Phil..Could the link between Longwell Green and ECW be as simple as LG Coachworks being in Bristol (about five miles from the Bristol factory) and simply that the designers were surrounded every day by ECW designs and so copied a lot of the detail into their work. ECW bodies were in my opinion beautifully built and highly workmanlike so maybe they thought that was a good one to emulate. That is, of course, possible. As Phil Blinkhorn says, the main key to the belief that the Longwell Green bodies are on Burlingham frames is in the rear profile of these buses. Search Flikr for "Stockport Corporation Bus" and a picture of #343 parked up on route #40 should emerge. There are other steers too. The radius on the window frames and more so on the destination and route number frames suggest that there are Burlingham influences there too. Many prefer the Burlingham bodied batch of PD2’s that Manchester Corporation to the contemporaneous MCW products. Not I, nor the Burlingham bodied CVG’s that Manchester acquired at the same time. Despite all the problems that Stockport Corporation had in obtaining (and finishing some of) the Crossley bodied PD2’s they remain quite my favourite combination of PD2 bodies for SCTD. 4 bays beat 5 in my book on 27′ double deckers. And finally, how nice to see a SCTD Crossley bodied Leyland running around Stockport again after all these years. I refer of course to Tiger Cub #403. One of the Longwell Greens certainly did run in service in orange – 5947 (347). I remember being surprised in the autumn of 1974 when, after having been the last one remaining in service for some time and I assumed due for early withdrawal(although many others had of course become trainers in orange)it reappeared in the then-new darker orange GMT livery. It then lasted until about October 1978 I think. These bodies may have been excellent but the two things I noticed about them was the finish inside, which wasn’t really up to the later East Lancs standard, no grab rails at the front upstairs for instance, and the extreme degree of body roll when cornering, again compared to the EL ones. I feel that I must speak in favour of the Yorkshire Rider livery. It was bold but professional and very dignified in rich green and cream, and the prominent red fleetname with former districts’ identities was quite masterly – especially since the Company name and the livery had to be devised with indecent haste in the unbelievable confusion leading up to De-regulation Day in October 1986. The Yorkshire Rider livery was bold and contemporary with out being overly so. It had more presence than the PTE livery and was a million times better than the First fading scheme and the current pale pastel which always reminds me of some wartime austerity livery. Although the use of local fleet names is a step in the right direction. But they need to make a bold statement with a strong livery.